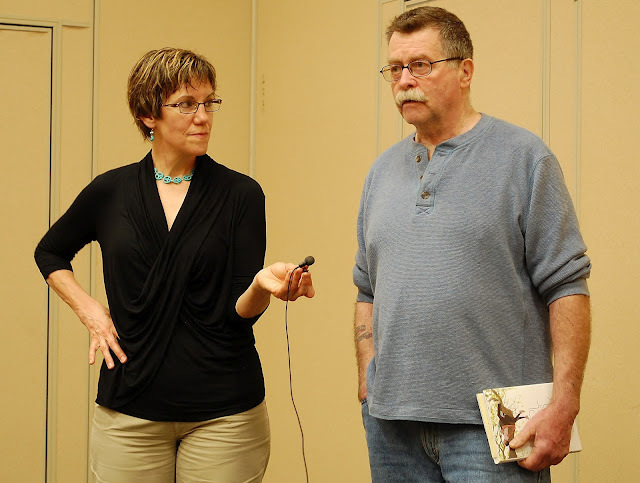 During the week of March 19, 2012, Terry Davis and Rebecca Fjelland Davis did two readings of their stories in the Chronicle Book anthology, GIRL MEETS BOY -- one at the Mankato, MN Barnes & Noble and one at South Central College. Becky said in her blog, "It was fun, and people seemed to both enjoy and take something from the experience. Terry was his stellar teaching self at SCC." Writer Nicole Helget captured these images and we borrowed them from her insightful blog. ...Terry Davis is alive and well and living the life he almost lost in January. His friends and family are celebrating with him in Mankato, MN. Photo courtesy of Deb Halverson Joerg. Thanks, Deb!